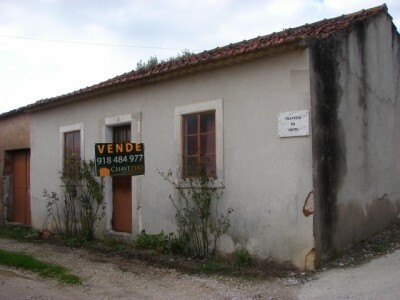 A traditional stone country cottage for sale near Torres Novas in central Portugal. The cottage, which is set over one floor, measures 150 square metres of construction and has metal framed windows and doors. The cottage is set on a gravel road and has good, open country views to both the front and the rear of the cottage. There are neighbouring properties within the vicinity though none which over look the cottage. The cottage is traditional in design and has 50 centimetre thick walls. There is a living room, off which there are two traditional sized bedrooms with wooden floors and ceilings. There is a traditional, rustic kitchen to the rear of the cottage. In addition to this there are two storage buildings, which are attached to the cottage. Both of these storage buildings have also been constructed in stone and could, with the correct permissions from the local council, be converted into additional living space if required. The cottage is set in a quiet area and although does require renovation and modernisation work, could be turned into a peaceful country retreat for holidays in Portugal. The cottage is situated near the village of Assentiz in central Portugal. There are several cafes and a mini-market within the village of Assentiz and the larger town of Torres Novas is approximately 15 kilometres away. The historic town of Tomar, which is home to the UNESCO listed Convento do Cristo constructed by the Knight Templars, is approximately 12 kilometres from the property. Tomar has a variety of shops, supermarkets, builders’ merchants, architects, schools and bus and train station. The property is easy to access and to locate. It is approximately one and a quarter hours’ from the closest airport, which is at Lisbon. Lisbon airport is accessed by several low cost airlines, which operate regular flights into and out of the United Kingdom.